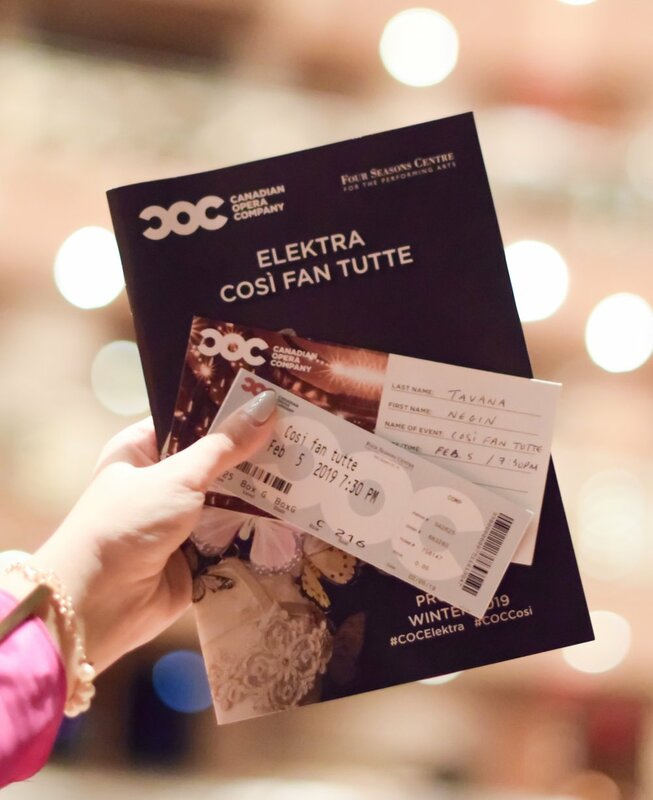 On Tuesday evening, my best friend and I, got to attend one of the most glamourous events in Toronto, the opening night of “Così fan tutte” by Mozart (click here) at the Four Seasons Centre for the Performing Arts. This was not one of our typical girls night outs. Usually, we go to some low-key sushi place uptown for our gossip sessions, and occasionally (for something a bit more fun) we go for drinks and bites somewhere chic downtown. Never had it crossed our minds that the funnest thing to do would be to go to the opera! For some reason, I was always under the impression that the opera was for your grandparents and maybe something only old people would do - but boy was I WRONG!! 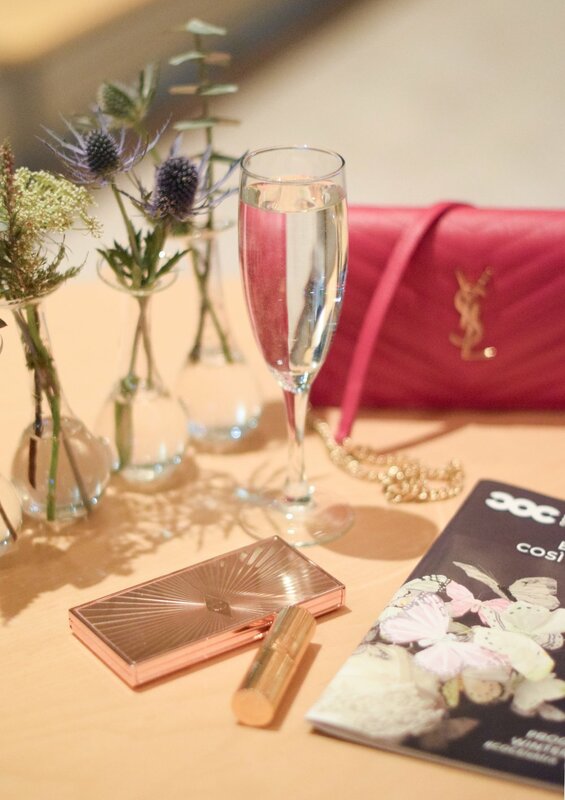 The Four Seasons Centre was filled with young cosmopolitans; groups of young professionals, couples on date night, and many like us: on a girls night out. Usually, I spot the nicest outfits at Fashion Week, but I really hadn’t seen such CHIC outfits anywhere else in Toronto. I kept thinking, “so this is where everyone’s been hiding” as we made our way to the grand staircase, with the most magical view of downtown Toronto. We were escorted to the Henry N.R. Jackman Lounge on the second floor , which was reserved for donors of the Canadian Opera Company. We left our coats at the coat check there, and proceeded to find ourselves some bubbly at the lounge (and we couldn’t help but feel like royalty). As the lounge started to become more crowded, the bell went off and we were notified to go and find our seats. We were given pretty amazing seats, our own box on the second floor; where we were promised the best sound of the orchestra. Not to be spoiling too much for you, Così fan tutte is about two young men who are in an attempt to test their fiancées’ fidelity. They pretend to leave for war, but return in disguise and try to woo each others’ fiancées. This production of Così fan tutte, is directed by award-winning film and stage director, Atom Egoyan. Featuring larger than life butterflies and beautifully crafted projections, the plot unfolds as if it is intended as a lesson for lovers. The breathtaking music, composed by Mozart and performed by world class signers, takes you on a journey; comedic in some parts and simply heartbreaking in others. Everything works together to create pure magic, the orchestra, the stage, the performers, the costumes, and even the audience carries itself, with a breath of elegance and charm. Half-way through the performance, during intermission, we headed back to the Jackman Lounge, where our previously-ordered charcuterie board and more bubbly was waiting for us. We vouched that we’d attend every opening night by the Canadian Opera Company, as our fancy girls night outs. We mingled for about a half hour predicting whether the characters would finally be wooed by the men in disguise. We ran back to our box, and waited for the second half of the performance to unfold. I can’t tell you what happens in the end, because I want you to go see the performance yourself; to catch the enchanting voice of a woman who cautions young girls “we can love them and leave them as we please.” Catch Così fan tutte at the Four Seasons Centre for the Performing Arts February 5th to February 23rd. The Canadian Opera Company also sells discounted tickets, as low as $22 (WHAT?!?!!) for those under 30 (click here). On top of that, you can use the code NEGZILA and receive a 15% discount off an performance of Così fan tutte. Thank you to the Canadian Opera Company, for giving us a chance to escape our deadline-filled daily lives, put on a fascinator and get a little fancy. Outfit Details: Charlotte Olympia heels, YSL purse, YSL bangle, and a Zara headband. My dress is from Topshop but I’ve stitched on shoulder pads from Amazon for extra sass!